Whether it’s your goal to collect food, raise funds or a combination of both, events of all sizes play an important part in raising awareness about hunger in Mississauga and providing the food and funds we need to feed our hungry neighbours. Follow the easy steps below to get started! You must register your event at the bottom of this page. Make sure you read our Food Drive/Fundraiser Guidelines that were created to help organizers maintain The Mississauga Food Bank’s values and mission. Use your imagination when it comes to ideas! Feel free to use your own ideas, or take a look at some of our suggestions. The ‘when’ and ‘where’ is the easy part of an event, following through is the fun part! Challenge your school, colleagues or community to help reach a specific weight or number of bins filled. Generating 100% participation is a goal. If you’re organizing a corporate event, find out if your company will match gifts. We can lend you food collection boxes that hold 250-300 lbs. Or collect food in your own containers or boxes. We can only pick up collections greater than 500 lbs (about 50 grocery bags), but we appreciate donations being dropped off. Drop donations at a fire station. Financial donations CANNOT be dropped at fire stations, they should be brought to our warehouse. Do you want to take your fundraiser or food drive to the next level? Consider fundraising online! Online donations are much easier to manage than heavy cans and boxes and for every $1 you raise, we can distribute food for 2 meals! Contact us to discuss how you can use an online giving page for your next fundraiser. How many people do you expect to get involved? To give you an idea, our standard food collection boxes hold 250-300 lbs of food. Two full plastic shopping bags hold about 25 lbs of food. When do you expect to send The Mississauga Food Bank monetary donations? If you would like a pick-up, please use our truck route map (below) to determine when we will be in your area. 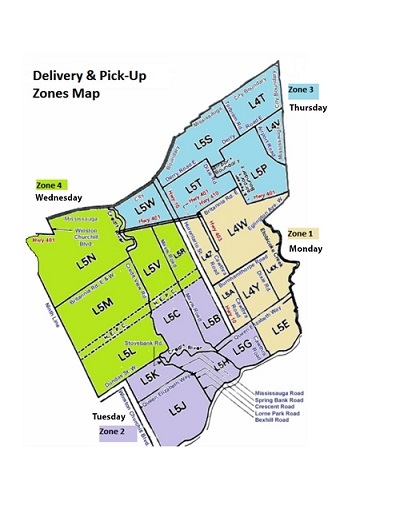 We can arrange a pick-up or delivery ONLY on the days when our truck is in your zone. Do you need food collection boxes? Do you need food collection boxes? Each box holds 250-300 lbs, so please request the appropriate number. Boxes fold flat to fit in a car, so if you're able to pick up, we appreciate your help in saving resources. Do you need a food pick-up? Other information regarding your drive. By submitting this form, you confirm you have read our Food Drive/Fundraiser Guidelines.